We’ve partnered with Warner Bros. Home Entertainment for a giveaway of the brand new Be Cool, Scooby-Doo! Season 1 Part 1 DVD. 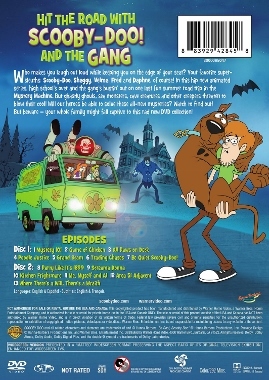 Available February 23 for purchase , this two-disc DVD set includes 13 episodes of this latest Scooby-Doo! animated series. One lucky winner will receive this DVD. To enter for a chance to win, answer the easy question in the Rafflecopter form below by February 29, 2016 (U.S. residents, 18+ only, no P.O. boxes). My favorite part of Scooby Doo is the wild adventures they go on – it always seems like they are having a great time! The aspect of Scooby Doo I like the best is the mystery! I just like how Scooby and Shaggy had the munchies no matter what was chasing them. We think Scooby Doo is a funny character! I liked that they were funny. What would it be without Scooby Doo!! I’m not a big fan but my daughter absolutely loves Shaggy and Scooby! Thanks for the chance! I like the mystery in it. I like the camaraderie of Scooby and Shaggy. Thank you for the fun giveaway. I loved the special guest stars like Jonathon Winters, The Globetrtters and Batman. My favorite aspect of Scooby Doo Cartoons is Scooby and all the gang scarily and hilariously at times, trying to solve a mystery as only they can do! I also love the snacks, traps, and Velma’s intellect!! I like seeing Scooby and Shaggy constantly eating. I like the show in general but Scooby is the best part to me, his voice, his cuteness, his love of food, how he is always scared but still manages to be a hero, etc. My favorite aspect of Scooby-Doo cartoons is the humor! Thanks for the chance to win! My favorite aspect is all of the adventures they go on as friends. They have so much fun and are ageless in their appeal.